It's gotten rather chilly the last couple of days. Probably more normal for this time of year but we were spoiled. My image today is from a windy day this past February. 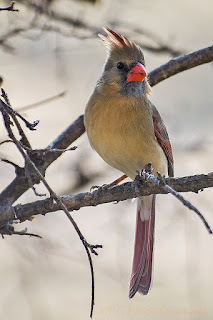 I was able to capture this female Cardinal sitting in the Mulberry tree right outside the window. She was being a bit ruffled by the wind but posed very nicely for me to get a close up photo of her.